I'm very happy to post my 200th post today. Thank you Friends for your constant support. Without your encouragement, I couldn't have come so far. Enjoy this Poha&Dates Payasam.... I will come with the recipe later. On this special day, I'm announcing my second event. After the successful completion of the first event, in these couple of months I selected many themes but I was not satisfied with anything. Finally, when I decided to announce an event again with fruits, Priya Mitharwal announced an event which was very much similar to what I thought. Then my husband gave me the idea for Green Theme. Before, I announce that I saw Preeti's announcement. Again I had to drop the idea. So, not much of delay, I'm announcing "Best Out Of Waste" event today. This is also an unusual theme like earlier event "Think Beyond the Usual with Fruits" but I know that my friends are very innovative and soon they would fill my inbox with their innovative dishes. Now straight to the theme. Although we are aware that vegetable and fruit peels are rich in nutrients we peel and throw them to bin. Most of the vegetable or fruit peels are not edible as such. But they have high nutrient content as well medicinal value. So, we should definitely consume them in any form. In general peels are rich in fibre and most of the fruit peels have antioxidant in them. Then there are vegetables that usually come with leaves for example, Radhish. I never used radhish leaves until I learnt the health benefits associated with it. Another example I can give is Beet leaves...Think of other vegetables like this and come up with your innovative dishes.These leaves would taste bitter but they are needed for better health...atleast let us start to utilize them from now..
Pumpkin, squash and melon seeds are in general edible. They too have lot of health benefits. For example, as per a study conducted by Department of Food Science and Technology in Iran, the cantaloupe seed have good source of phosphorous, potassium, and sodium. Similarly, we have the habit of discarding stalk. For example, consider beet stalk. Most of us throw away the beet stalk and only a few people use them in food. Think of other vegetables like this where we can use the stalk in cooking and get benefitted. I think, I've outlined what I exactly want for the event. Please keep the theme "Best out of waste" in your mind before you prepare the dish. I made that bouquet with apple, pear, lemon, pumpkin peels, mint stalk(none of you guessed this!) and tender cilantro leaves (I know, this is not a waste but just used as a leaves for bouquet) I'm proud to say, that bouquet made out of waste is going to be my event's logo. 2. You can send me any dish made out of waste but I want only vegetarian dishes (No eggs too). 3. 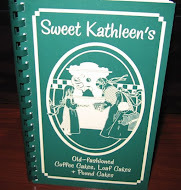 You can use fruit as well vegetable wastes to create your innovative dishes. 4. Link your post with this event announcement. 5. Old entries are accepted if they are reposted with the link to this event announcement page. 6. No limit to number of entries. 9. Send your entries to nithuskitchen@gmail.com with the subject line "Best Out Of Waste" and with the following details. 10. Non-bloggers send your entries to above mentioned mail id and subject line with the following details. 11. The event ends on July 5, 2010. Late entries will not be entertained. 12. I'l acknowledge your entry as soon as I receive them. If I don't reply you for more than couple of days, please do mail me or leave a comment here. Congrats Nithu for 200th post dear, keep rocking and payasam looks super delicious and tempting..
Will definitely send my entries for ur beautiful event dear..Awesome theme..
Congrats dear on your 200th post, payasam looks great and def tasted yummy. Enjoy your event and the weekend too. Congarts Nitu on your 200th post. Keep on rocking!! Payasam looks yummy. Nice theme for the event. Count me in dear. 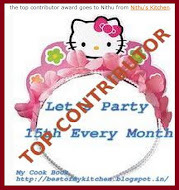 Dear Nithu,Congratulations on your 2nd century.Wish to see many more such centuries of recipes and events from you.Very nice event,I love this theme.Thank you for the award.Will post it soon. Keep rocking dear...Many more success are there in your way...! 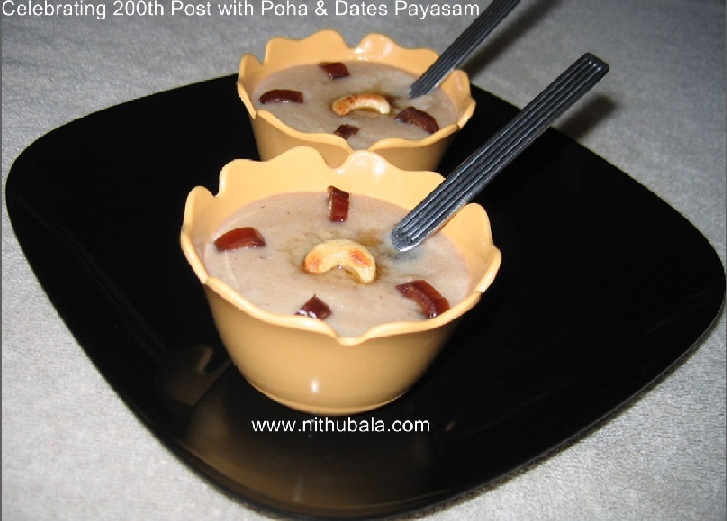 Congrats on your 200th post Nithu..Payasam looks perfect for celebration!!! Congrats Nithu on 200 posts. 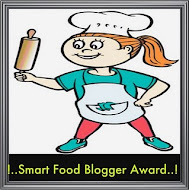 Wow, amazing milestone, may many more such 100s come and go and we get to see your creativity and share wonderful recipes. Congrats on your 200th post! Keep rocking. Congrats on your successful milestone. Congrats to everyone who guessed it right. Will think of something for this event! Congrats on your 200 posts; Looking forward to many more from you. Nice event too. Happy hosting.I will try to send some thing. Congratz on your 200th post..wonderful theme..Sure we try to send some Best out of Waste!! Btw we are also a having a contest for summer themed recipe and best food photograph.It is our pleasure if you could participate in our Sizzling Summer Contest.You could win one of the two $50 prizes. Congratulations on ur 200th post dear!!!! 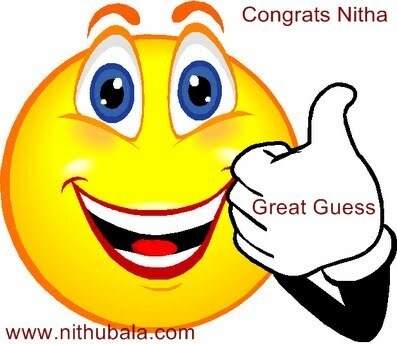 Nithu,,congrats on ur 200th post dear Payasam looks perfect i like poha payasam dear and you have announced a nice event dear..
Congrats Nithu, way to go dear, and a nice event too. Let me see what I can send. Congrats! Payasam looks very inviting! Happy Hosting! Congrats Nithu!! Payasam sounds yumm!! Interesting event gain, will send my entries..
Also excellent theme for the event. Count me in. I have tons of ideas...hope I have the time to cook all of them. 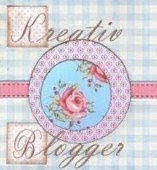 Do visit my blog when you have sometime. first time here. 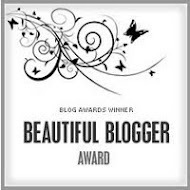 congrats on the bloggy achievement. great event, i will for sure participate. 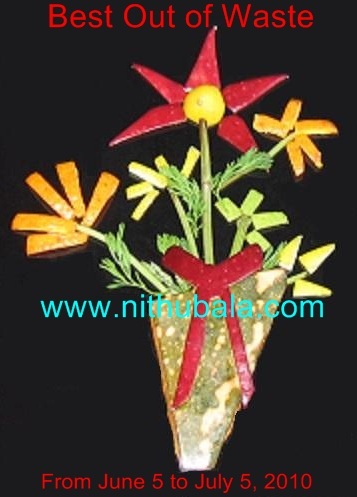 Hi Nithu, great event. count me in and Congrats. Congrats Nithu... visiting your blog for the first time...must say very innovative to come up with this idea for the event...I will surely make something and post soon. Loved ur recipes ..following your blog. LOved the event...what an innovative one!let me see if i can do something abt it!Have a recipe in mind, but posting on time is the hard part. Thx Nithu for ur lovely comments...and congrats on ur 200th post. 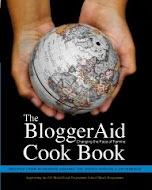 Lovely event..Wl def try doing something and send..
hai nithu i am also sending one recipe.